Hubby and I decided to restart Meatless Monday. Where we would not eat any meat once a week. Times like these I really take my hat off for those vegetarians. It's so hard to make a filling dinner without any meat! How do they do this everyday!?!? 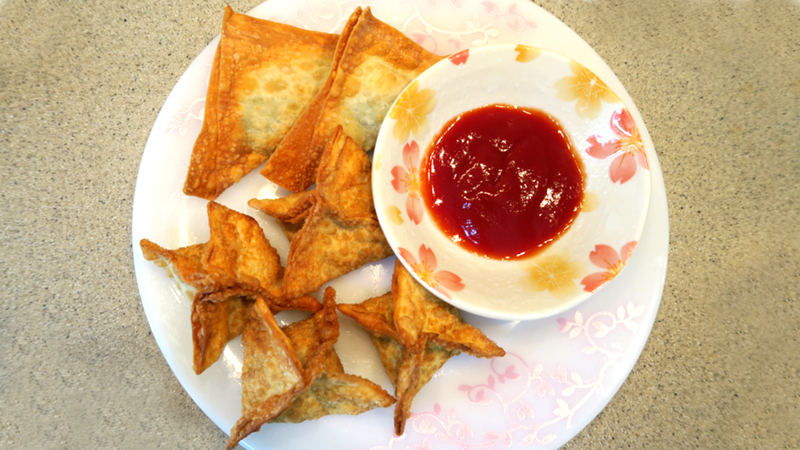 My initial idea for a spinach wonton came from Ding Tai Fung's fried spinach wonton. We love it, but I think there's some pork in it. So I was surfing YouTube for fried spinach wonton recipe when one suggested video showed Cheese and Spinach Wontons. I was intrigued. My kids love cheese and anything crispy. Spinach and Cheese? Sounds like a good idea! I don't know who's recipe this belongs too, but it seems like many people are making them and loving it. So I gave it a try. Packed with nutritious spinach and cheese for strong bones, sinfully crispy, and best of all, it's so easy to make! Wah.. No wonder it's so popular.. Don't take my word for it, my 2 kids were fighting each other for the last piece while the 2 adults barely have enough to eat. T_T So I would say this is a successful recipe. One for the books! Wash and cut the spinach. Cut and discard the roots, cut into smaller sections and wash thoroughly. Heat up a deep frying pan with some oil and add in crushed garlic. If you don’t have a garlic crusher, mince it as fine as you can. Add in the Spinach before the garlic turns brown, (which only takes less than a minute) salt and sugar, and stir fry vegetables until it is tender. Put cooked spinach in a strainer and strain out as much liquid as you can. Chop up the spinach finely. Set aside in a big bowl. Add room temperature cream cheese into the bowl with the spinach and mix well. Mix flour with water to make the “glue”. 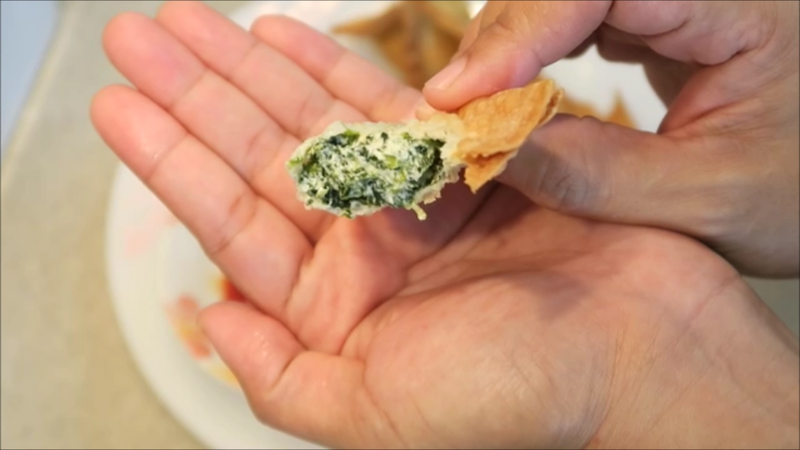 Place spinach and cheese fillings in the wonton skin and seal up the wonton with the “glue” mixture. See video on different ways to wrap a wonton. Fry in medium-high heat oil until the wonton is light golden brown. You can freeze the raw wontons. Place them in a ziplock bag but make sure they don’t stick onto each other. Carefully place them into the freezer. When it’s frozen, you can bunch them up together. When you want to serve them, directly deep fry them as per normal until light golden brown.